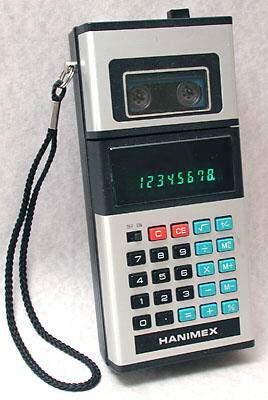 Distinctive features: Combined calculator and mini-cassette recorder. Combined calculator and mini-cassette recorder (suitable for dictation). Four functions, %, memory, square root. 4.5v (3 x AA batteries). 81 x 163 x 40 mm (3.2" x 6.4" x 1.6"). Made in Japan, for Hanimex (an Australian company). 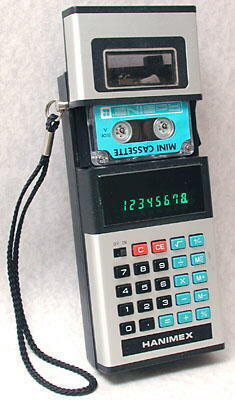 By the mid 1970s calculator electronics had become small and it became practical to combine a calculator with something else, as here with the mini-cassette recorder.